Comments: Ruth Roberts, daughter of William Smithson and Mary (Stinson) Roberts, was born August 1904 in Scottsville. She attended 'School on the Hill' above Valley Street from elementary grades through high school. 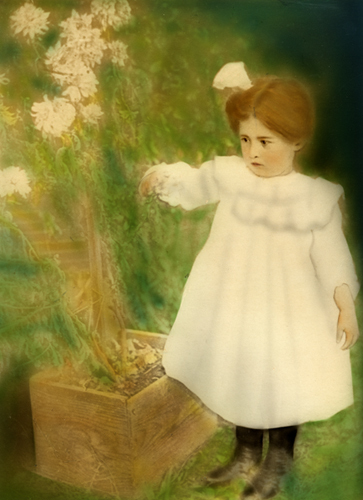 Shown here in this 1908 hand-tinted photograph by Burgess, Ruth demonstrated a curiosity typical of her throughout her entire life. In 1916, a barnstormer landed near Scottsville and offered to take flying any town person who dared get into his biplane. This girl was the only 'taker' and, at 12 years of age, buzzed over Scottsville for ten minutes in a ride she described in her diary that evening as one "I enjoyed just fine." After high school, Ruth earned her teaching certificate at the University of Virginia and moved to Washington, DC, to acquire a good job with Western Union. And thus began a life of adventure that took Ruth to every state in the US and to Cuba, Europe, Asia, Africa, the Middle and Far East. She married 1) Arthur Skipper in 1931, and 2) Jacob Macon in 1949. Ruth Roberts Macon died January 31, 2000, in Alexandria, Virginia.